Learn to add images, background, character or music to your story. 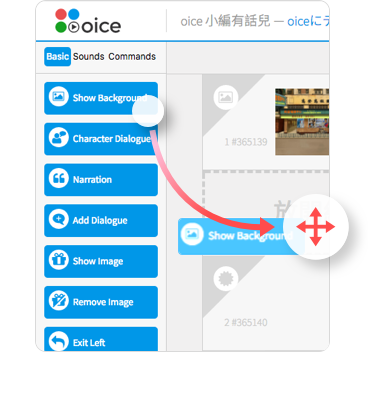 In the left panel of the oice editor interface there are some components which are the basic elements of your script. You can add these components to your script by drag-and-drop to the scripting area in the middle of the editor tool, or simply by double-clicking the component. There are three component categories: Act, Sound, Editing. You can adjust the component’s parameters of the current script at the right-hand-side of the tool. 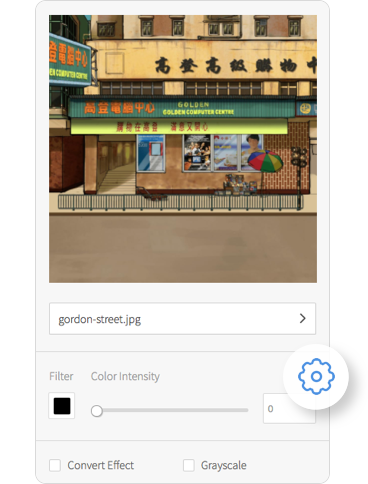 Take the “Background” component as an example, you can choose the background pic, apply a filter, Invert and greyscale effect, setup fade-in time, etc. The changed parameters will be saved automatically. Different components have their own set of parameters. You can arrange the components in your story script in the middle panel of the tool. You can change the order of the components by drag-and-drop, duplicate or delete a component. There are two important buttons at the top of the tool: “Preview” and “Publish”. Clicking either buttons can build your oice episode, the difference is that “Preview” keep the episode under temporary state but “Publish” push the episode to the public. The published episode can be viewed by any oice appusers unless you set the property of this episode to “private”. You can still share the URL of the private episode to anyone though. You can view your story by oice app on your handset, by opening the URL of the published episode.